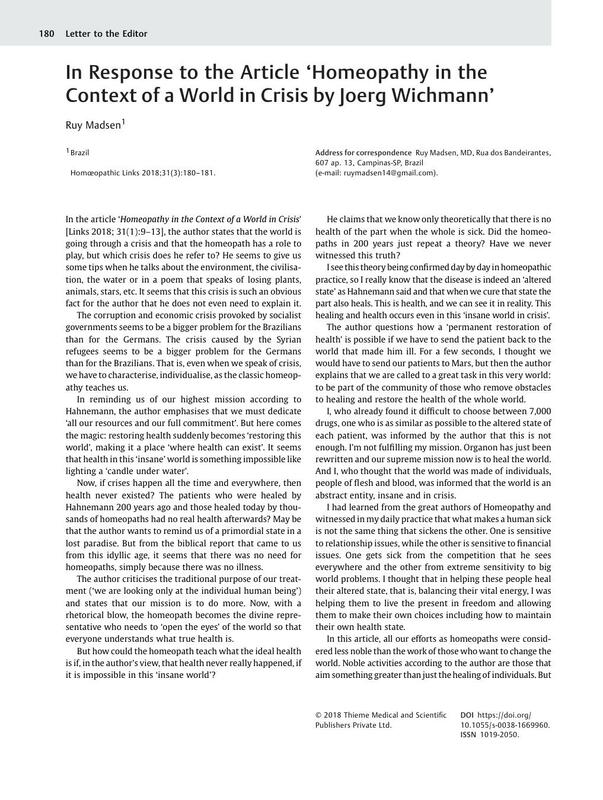 In the article ‘Homeopathy in the Context of a World in Crisis’ [Links 2018; 31(1):9–13], the author states that the world is going through a crisis and that the homeopath has a role to play, but which crisis does he refer to? He seems to give us some tips when he talks about the environment, the civilisation, the water or in a poem that speaks of losing plants, animals, stars, etc. It seems that this crisis is such an obvious fact for the author that he does not even need to explain it. The corruption and economic crisis provoked by socialist governments seems to be a bigger problem for the Brazilians than for the Germans. The crisis caused by the Syrian refugees seems to be a bigger problem for the Germans than for the Brazilians. That is, even when we speak of crisis, we have to characterise, individualise, as the classic homeopathy teaches us. In reminding us of our highest mission according to Hahnemann, the author emphasises that we must dedicate ‘all our resources and our full commitment’. But here comes the magic: restoring health suddenly becomes ‘restoring this world’, making it a place ‘where health can exist’. It seems that health in this ‘insane’ world is something impossible like lighting a ‘candle under water’. Now, if crises happen all the time and everywhere, then health never existed? The patients who were healed by Hahnemann 200 years ago and those healed today by thousands of homeopaths had no real health afterwards? May be that the author wants to remind us of a primordial state in a lost paradise. But from the biblical report that came to us from this idyllic age, it seems that there was no need for homeopaths, simply because there was no illness. The author criticises the traditional purpose of our treatment (‘we are looking only at the individual human being’) and states that our mission is to do more. Now, with a rhetorical blow, the homeopath becomes the divine representative who needs to ‘open the eyes’ of the world so that everyone understands what true health is. But how could the homeopath teach what the ideal health is if, in the author's view, that health never really happened, if it is impossible in this ‘insane world’? He claims that we know only theoretically that there is no health of the part when the whole is sick. Did the homeopaths in 200 years just repeat a theory? Have we never witnessed this truth? I see this theory being confirmed day by day in homeopathic practice, so I really know that the disease is indeed an ‘altered state’ as Hahnemann said and that when we cure that state the part also heals. This is health, and we can see it in reality. This healing and health occurs even in this ‘insane world in crisis’. The author questions how a ‘permanent restoration of health’ is possible if we have to send the patient back to the world that made him ill. For a few seconds, I thought we would have to send our patients to Mars, but then the author explains that we are called to a great task in this very world: to be part of the community of those who remove obstacles to healing and restore the health of the whole world. I, who already found it difficult to choose between 7,000 drugs, one who is as similar as possible to the altered state of each patient, was informed by the author that this is not enough. I'm not fulfilling my mission. Organon has just been rewritten and our supreme mission now is to heal the world. And I, who thought that the world was made of individuals, people of flesh and blood, was informed that the world is an abstract entity, insane and in crisis. I had learned from the great authors of Homeopathy and witnessed in my daily practice that what makes a human sick is not the same thing that sickens the other. One is sensitive to relationship issues, while the other is sensitive to financial issues. One gets sick from the competition that he sees everywhere and the other from extreme sensitivity to big world problems. I thought that in helping these people heal their altered state, that is, balancing their vital energy, I was helping them to live the present in freedom and allowing them to make their own choices including how to maintain their own health state. In this article, all our efforts as homeopaths were considered less noble than the work of those who want to change the world. Noble activities according to the author are those that aim something greater than just the healing of individuals. But the problem is that all the great activities that he suggests have to do with the healing of individuals. What do ‘Homeopaths without borders’ do besides treating individuals? What was Jeremy Sherr doing in Africa but healing individuals? Are they treating an abstract entity called ‘the world in crisis’ or real people with real individual sufferings? African patients are as real as the patients in the offices of those homeopathic colleagues who work from morning till night and who have little time to take care of themselves and their families. Why do good examples of homeopathic activity come only from Africa or from places of extreme poverty and not from our own practice? The task is to devote ‘all resources and our full commitment’ to the one supreme mission to heal our neighbour, isn't it? So why did our neighbour in Africa become closer than the sick person who lives in my hometown and sends e-mails on Sunday evenings? Ideas like those in this article seem beautiful, they convey a commendable concern, but are far from reality and are dangerous as so many historical examples have shown us. We must never forget that the best ideas to improve the world have also stimulated the greatest dictators. If we want to improve the society in which we live, we must first of all improve ourselves. As the psychologist Jordan Peterson teaches us, one of the rules of life is ‘to set your house in perfect order before you criticise the world’. Helping the largest number of patients, healing real people, publishing our cases, all these are done not only to show our results for sceptics to believe in Homeopathy, it is done to improve ourselves, develop our healing instruments, our methods of analysis which will allow us to help even more people here in Brazil, in Germany or in Africa. This is our duty as homeopaths.